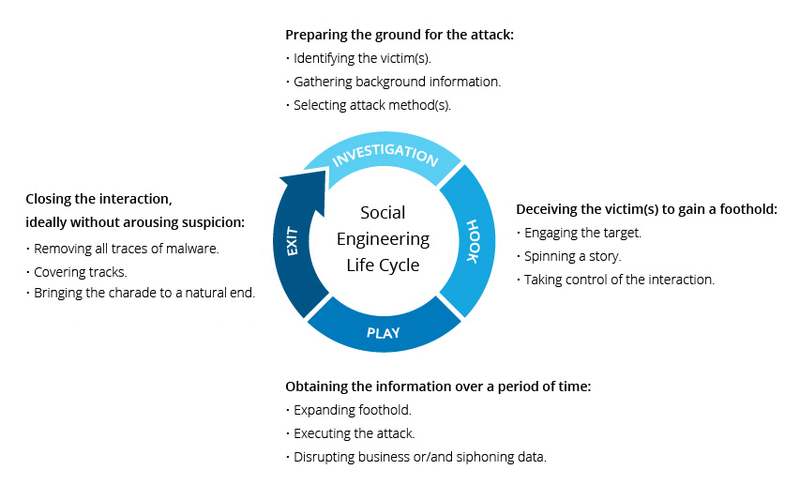 Social engineering attacks happen in one or more steps. A perpetrator first investigates the intended victim to gather necessary background information, such as potential points of entry and weak security protocols, needed to proceed with the attack. Then, the attacker moves to gain the victim’s trust and provide stimuli for subsequent actions that break security practices, such as revealing sensitive information or granting access to critical resources. Social engineering attacks come in many different forms and can be performed anywhere where human interaction is involved. The following are the five most common forms of digital social engineering assaults. Given that identical, or near-identical, messages are sent to all users in phishing campaigns, detecting and blocking them are much easier for mail servers having access to threat sharing platforms. This is a more targeted version of the phishing scam whereby an attacker chooses specific individuals or enterprises. They then tailor their messages based on characteristics, job positions, and contacts belonging to their victims to make their attack less conspicuous. Spear phishing requires much more effort on behalf of the perpetrator and may take weeks and months to pull off. They’re much harder to detect and have better success rates if done skillfully. A spear phishing scenario might involve an attacker who, in impersonating an organization’s IT consultant, sends an email to one or more employees. It’s worded and signed exactly as the consultant normally does, thereby deceiving recipients into thinking it’s an authentic message. The message prompts recipients to change their password and provides them with a link that redirects them to a malicious page where the attacker now captures their credentials. Social engineers manipulate human feelings, such as curiosity or fear, to carry out schemes and draw victims into their traps. Therefore, be wary whenever you feel alarmed by an email, attracted to an offer displayed on a website, or when you come across stray digital media lying about. Being alert can help you protect yourself against most social engineering attacks taking place in the digital realm. Moreover, the following tips can help improve your vigilance in relation to social engineering hacks. Don’t open emails and attachments from suspicious sources – If you don’t know the sender in question, you don’t need to answer an email. Even if you do know them and are suspicious about their message, cross-check and confirm the news from other sources, such as via telephone or directly from a service provider’s site. Remember that email addresses are spoofed all of the time; even an email purportedly coming from a trusted source may have actually been initiated by an attacker. Use multifactor authentication – One of the most valuable pieces of information attackers seek are user credentials. Using multifactor authentication helps ensure your account’s protection in the event of system compromise. Imperva Login Protect is an easy-to-deploy 2FA solution that can increase account security for your applications. Be wary of tempting offers – If an offer sounds too enticing, think twice before accepting it as fact. Googling the topic can help you quickly determine whether you’re dealing with a legitimate offer or a trap. Keep your antivirus/antimalware software updated – Make sure automatic updates are engaged, or make it a habit to download the latest signatures first thing each day. Periodically check to make sure that the updates have been applied, and scan your system for possible infections.